in our life comes the nostalgy. 1950 – Born in João Pinheiro, a small town in the interior of the Minas Gerais State, Brazil. He spent most part of his childhood in contact with nature, in the fazendas where rivers and virgin forests forever leave a mark on his memory. 1961 – Moves to Belo Horizonte to continue his studies and contact with the works of Minas Gerais major painters. Starts to paint his first pieces. 1972 – Starts to work in the field of graphic arts under contract for editors. Produces book covers and visual programming. 1976 – Moves to Rio de Janeiro and starts to work for main publicity agencies, with renowned professionals. Produces illustrations for major Brazilian and international companies. 1988 – Studies at the Visual Arts School of Parque Large, one of the most renowned school in Brazil. 1988 – Selected for various exhibitions of arts in Brazil. Wins an award of the 5th Exhibition of Plastic Arts in São Paulo. A year after wins the Acquisition award of the 5th Exhibition of Contemporary Art of Americana (São Paulo State), as well as Special Reference at the XVII Primavera Show, in the town of Resende, Rio de Janeiro State. 1989 – Selected for an individual exhibition in the Museum of Contemporary Art of Americana, São Paulo state. 1990 – Moves to Lisbon, Portugal. Works under contract for advertising agencies, and then starts to work as an independent, producing illustrations for major Portuguese advertising agencies. 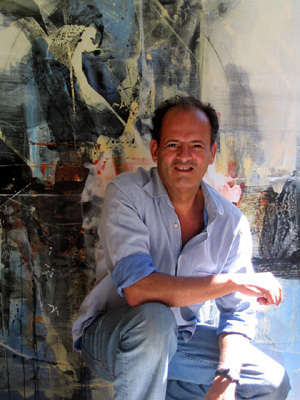 1994 – Starts to exhibit in Lisbon, proceeding to work on his paintings while working on advertising illustration. 1996 – Starts to dedicate himself only to painting, and a year after gives up completely advertising illustration.